A live interview on an Iraqi TV channel was cut short when a 7.3 magnitude earthquake shook the Iran-Iraq border. 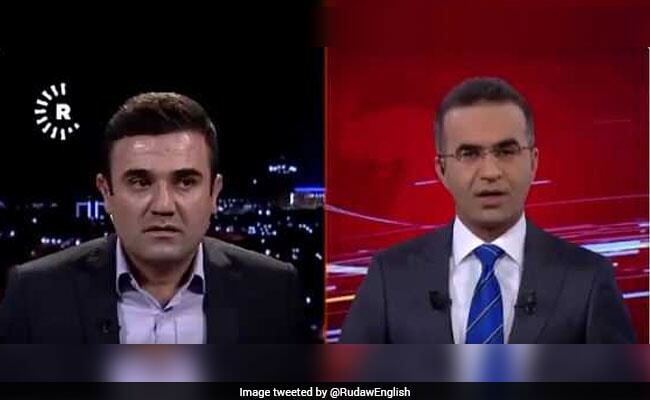 The news presenter, based in Erbil, was interviewing a politician from Sulaimaniyah, both in the country's northeast, when they started feeling the initial tremors. As the studio started shaking, the guest looked visibly nervous. "I feel there is an earthquake happening in Sulaimaniyah?" a concerned anchor asked the guest, as per a translation by The Guardian. The panicked guest soon abandoned his seat and left. "There is also an earthquake here, I can feel it. It's too strong, without a doubt," the news presenter announced. The now distraught presenter stopped the broadcast and said they will evacuate the studio for their safety. The channel Rudaw TV posted the terrifying clip on Twitter. 328 people died and over 2,500 were injured in the deadly earthquake on the Iran side, according to state television report. In Iraq, officials said the quake had killed six people in Sulaimaniyah province and injured around 150. The quake hit 30 kilometres southwest of Halabja in Iraqi Kurdistan on Sunday night, according to US Geological Survey. In Iran, rescue has been a challenge as the earthquake cut off roads to villages because of landslides in the affected area, according to Iran's emergency services chief.